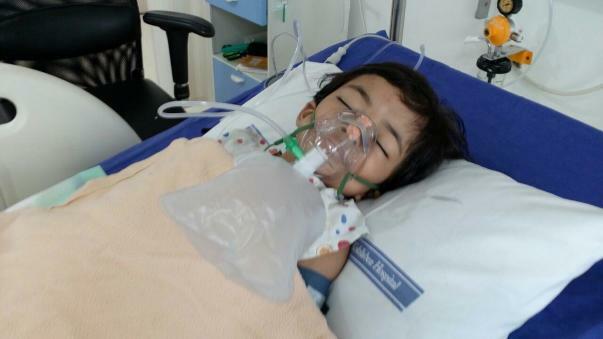 Hello, I am Padmini Bhattacharya from Mumbai and I am writing to you to seek your help for my 3.5yrs daughter, who is suffering from a rare genetic disorder of Intestine, known as Hirschsprung's disease. She has undergone 5 major and 2 minor surgeries till date without much success. 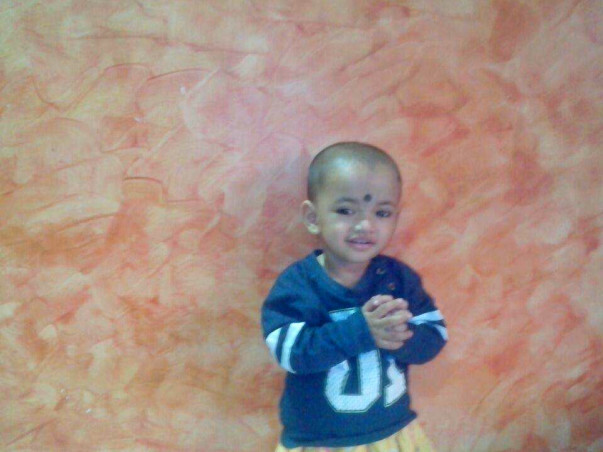 She is now shifted to Apollo Children Hospital Chennai where they are very hopeful about her recovery. They have suggested 2 more major surgeries, which costs 12 Lacs along with several other tests. I have already spent 13-14 Lacs in her treatment earlier in Mumbai and my financial situation is dire. 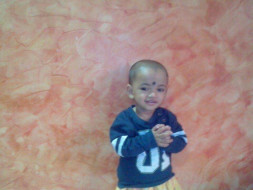 It is my earnest request to you all to help me arrange this fund to save my little daughter. We have exciting news to share with you today. She underwent the 7th supra major surgery yesterday. She is in the ICU at present on the ventilator. A part of her intestine that was affected has been removed. The doctors are pretty optimistic about her health and have suggested that this could be the last surgery that she would require. Hopefully, she will be discharged by Thursday or latest by Sunday after a few tests are conducted. The parents were both in tears when the doctors said that this will be the last surgery that she has to undergo. "She is a supergirl. We will send her to the best of school and let her become anything she wants to. Hats off to my daughter for enduring so much pain. ", Priyo Bhattacharya, Aaroyhi's father. Words are not enough to thank all of you who have showered us with your love and blessings. Thank you for giving us strength in this difficult time. Please do pray for her speedy recovery. Many Thanks again...God Bless you all. 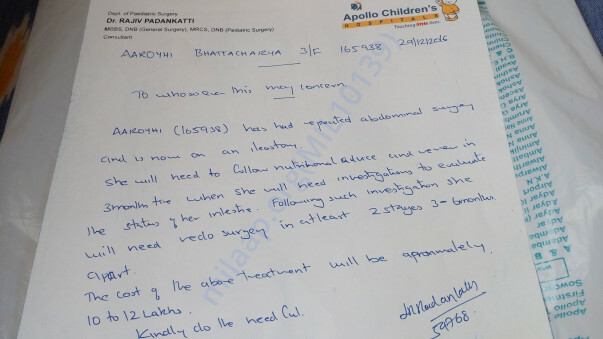 Aaroyhi has undergone her 6th Surgery and thereafter she is on a special diet again and needs to give her washes from the ileostomy on daily basis. Doctors are planning her next surgery in August 2017, please do pray for her health. Thanks for all help and continuous support. 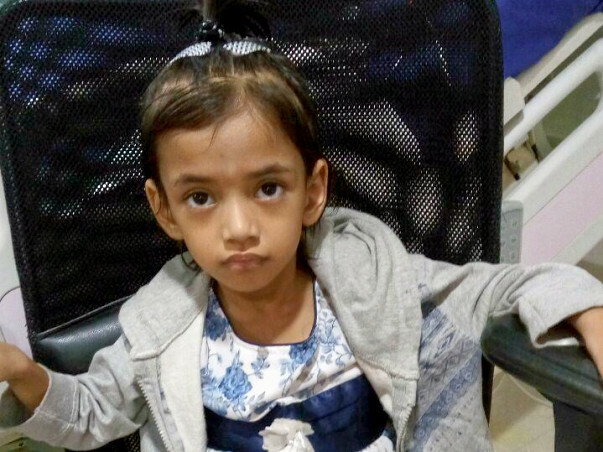 Aaroyhi underwent her 6th surgery last Saturday because she had swelling and blockages in her intestine. Doctor's are planning her 7th surgery in August 2017. Many thanks for all your continuous support.